Oh how I love first birthday sessions! The babies are so cute and are in this adorable age where they are so curious to try everything and are old enough to have a little bit of independence and can walk around and pick things up for themselves! Which is just great for these sessions, they're more than happy to dig into the cake and don't need any help sitting up or holding things, we just need to keep them on the backdrop. Wyatt was exactly that, she's so full of energy and would of ran around the whole studio 10 times if we would have let her. In the video at the end of this post you'll even see her run right up to the camera, SO CUTE. Before the cake smash, I always like to start the session with some classic portraits of the kids. This helps the kids get used to the studio and the flash, and gives the parents some more variety in the photos. ALSO these photos are really easy to replicate in future sessions, if you want a similar photo of your child every year to compare how much older they look. Since it's basically impossible to pose 1 year olds we get really sweet funny photos that perfectly show their personality! Then it was time for the main event! We decided on a 'Donut Grow up" Theme for Wyatt's cake smash photos. So not only did she have a cake to make a mess with, but donuts too! I even had a dress for her that matched the set up perfectly! 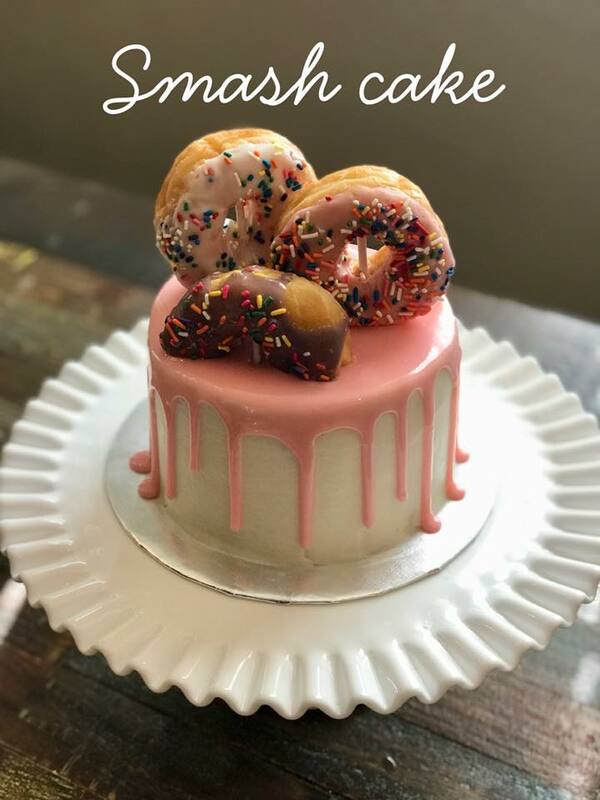 Thank you Happy Cakes for the super cute donut themed cake! We were able to admire the cake for about half a second before Wyatt took the donuts off and we had to remove the sticks for safety reasons. I was worried the cake wouldn't keep her attention and her mom was worried how she would react later to eating so much sugar. It could not have worked out better for both of us. Wyatt was all about smashing into the cake but wasn't really a fan of the taste so she barely ate any! Awesomeee. Little ones sometime don't like the sticky feeling of icing on their fingers, so a spoon is super helpful! I'm obssesed with little detail shots like this! So cute! Check out the video below for all the behind the scenes cuteness! Contact me today to start planning your own customized first birthday/cake smash session! View more first birthday photos I've done here.